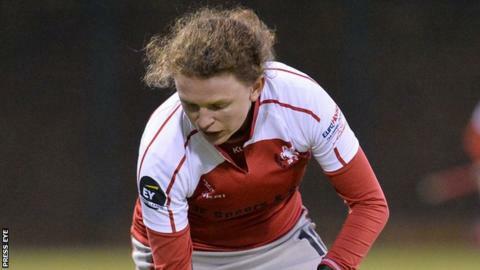 Pegasus closed the gap on second-placed Cork in the Women's Irish Hockey League with a 6-2 win at Trinity College. Alex Speers and Taite Doherty both scored twice with Lucy McKee and Ruth Maguire also on target for Pegasus. The Belfast side are just a point behind Cork Harlequins with a game in hand after the Munster side were beaten 2-0 by leaders UCD. Ards and Belfast Harlequins drew their games against Pembroke and Monkstown to keep alive their play-off hopes. In the game at Trinity College, Doherty opened the scoring for Pegasus, drilling in a low shot. McKee's spectacular solo effort put Pegs 2-0 ahead but before half-time Ellie Noone's strike had closed the gap. Two well taken efforts in the third quarter from Speers made the points safe before Maguire and Doherty added to Pegasus' lead before Sally Campbell's late penalty corner consolation goal for Trinity. With a semi-final place in the Irish Senior Cup already in the bag, Pegasus moved within a point of Cork Harlequins and with a game in hand after goals from Emma Russell and Deirdre Duke earned champions UCD a 2-0 win over Cork. UCD are now four points ahead of Cork and five ahead of Pegasus. Railway Union remain in fourth place after a goalless draw with Loreto and Ards stay within striking distance of a play-off spot as they held Pembroke to a 1-1 draw. Amy Benson gave Ards the lead but international Gillian Pinder equalised. Belfast Harlequins have games in hand on those above them and aren't out of play-off contention yet either. They drew 2-2 at Monkstown with Zoe Wilson and Abigail Edwards getting their goals.